SNS Creatine HCl can be cost effectively used by those looking for an Ultra-Concentrated form of Creatine that doesn’t require any loading and that does NOT cause the bloating and fluid retention that is normally associated with some other forms of Creatine. 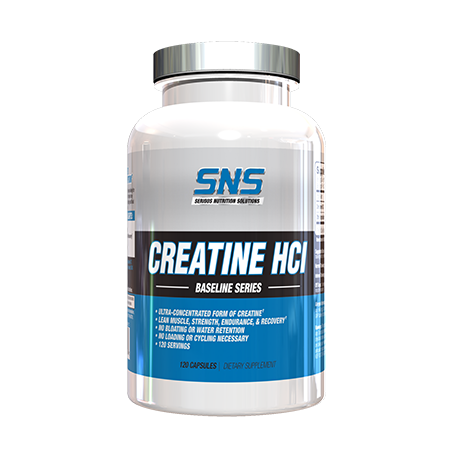 SNS Creatine HCI can be stacked with Agmatine XT, Beta Alanine, Citrulline Malate, Focus XT, X-Gels, VASO6, &/or many other SNS products for improved, synergistic results. As a dietary supplement take approximately 1 hour prior to training with a minimum of 4 to 6 ounces of water or juice. 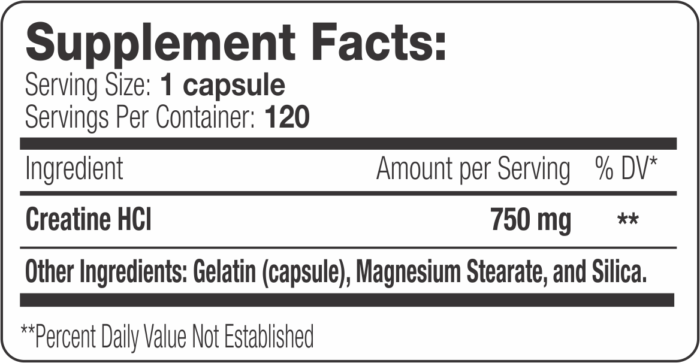 Normal Training: 1 serving (1 capsule) per 100 lbs. of body-weight. Intense Training: 1 to 2 servings (1 to 2 capsules) per 100 lbs. of body-weight. Off Days: 1 serving (1 capsule) per 100 lbs. of body weight to assist in muscle recovery. This product is intended for healthy adults over 18 years of age. Do not use this product if you are pregnant or nursing. Consult your physician before using this or any dietary supplement, especially if you are taking any medication or suffer from any health condition(s). Maintain adequate hydration when using. Keep stored in a cool, dry place. KEEP OUT OF REACH OF CHILDREN AND ANIMALS.